Address: 4001 Osuna Rd. N.E. In 1982, Skip began a home Bible study in Albuquerque, New Mexico which eventually grew into Calvary of Albuquerque. Calvary is a Christian fellowship where we gather for the purpose of knowing and glorifying Jesus Christ. We desire to see all people become committed to live as followers of Jesus Christ As the church is growing our vision also is growing. Consequently, we are a fellowship in the process of constant development by God. 1. Upreach -- We believe that loving God is man's highest calling and our relationship to Him is our highest priority. All ministry flows out of this relationship. 2. Inreach -- As members of a spiritual family, we seek to equip one another for service and to grow to spiritual maturity. Thus, we seek to be trained according to the Bible, which we believe is the "owner's manual" for our lives. 3. Outreach -- Our desire is to go out beyond the "Christian camp" into the world to expand the kingdom of God through evangelism. We believe God has given every Christian a "sphere of influence" in which to make an impact for Christ. Courses meet once a week and are designed to provide deeper understanding of the Gospel, and encouragement in living the Christian life. Classes are informal and conducted in small groups to provide opportunity for questions, answers, and discussion. Childcare is provided. Our Childrens Ministry, Which Is Called Bibleland, Provides Biblical Instruction And Care For Children From two Years Old Through fifth Grade At Every Regularly Scheduled Service. This Dynamic Ministry Operates Only With The Dedicated Help Of A Large Number Of Volunteers. We Work Hard To Provide The Best In Christian Bible Education To Our Students And Therefore We Are Constantly Evaluating The Curricula For Content And Personal Application. 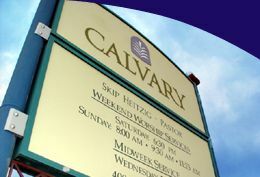 Calvary offers outreach to challenged Christians, centering on the Lord through His Holy Spirit. Participants come together to serve through prayer, worship, Bible study, and sharing, to encourage one another in the love of Jesus Christ. Connection Missions is the full-time missions branch of Global Adventures. Connection Missions staff communicate with our overseas missionaries and interview prospective missionaries. We "connect" each of our missionaries with one or more kinship groups for prayer support and communication. WE BELIEVE in JESUS CHRIST, God's only begotten Son, conceived by the Holy Spirit. WE BELIEVE in His virgin birth, sinless life, miracles, and teaching, His substitutionary atoning death, bodily resurrection, ascension into heaven, perpetual intercession for His people, and personal, visible return to earth. WE BELIEVE in the HOLY SPIRIT, who came forth from the Father and Son to convict the world of sin, righteousness, and judgment; and to regenerate, sanctify and empower all that believe in Jesus Christ for ministry. WE BELIEVE that the Holy Spirit indwells every believer in Jesus Christ and that He is an abiding helper, teacher, and guide. WE BELIEVE in the present ministry of the Holy Spirit and in the exercise of all the Biblical gifts of the Holy Spirit. WE BELIEVE that all PEOPLE are sinners by nature and choice and, therefore, are under condemnation; that God regenerates by the Holy Spirit, those who repent of their sins and confess Jesus Christ as Lord. WE BELIEVE that Jesus Christ baptizes the seeking believer with the Holy Spirit and empowers the believers for service, often subsequent to regeneration.